Last week was Restaurant Week in NYC. 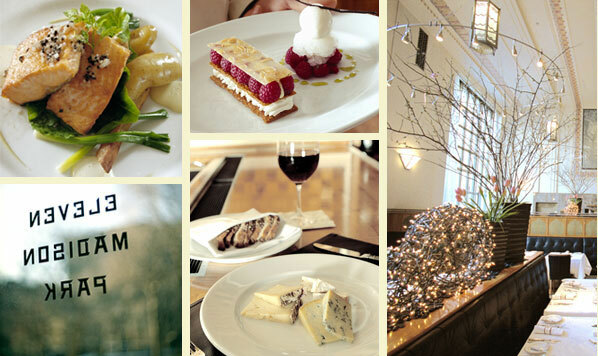 I sampled several participating restaurants, but the one providing the best experience was Eleven Madison Park. From my point of view, a restaurant that participates in Restaurant Week should do so to attract new customers who might otherwise be intimidated by the normally steep prices or just by the unknown. Therefore, you should put your best foot forward for customers stopping in that week. Eleven Madison Park was the only restaurant I visited that seemed to subscribe to that theory. After my friend and I had finished our lunch ($20.12 prix fixe lunch in honor of NYC's bid for the 2012 Olympics), chef Kerry Heffernan stopped by our table to ask how our meal was. Then they gave each of us a $20.05 gift certificate for our next meal there and a large chunk of chocolate shaped like a leaf. Exceeding expectations? Check. Return customer? Check. The staff and service were impeccable, a common denominator of all the Danny Meyer restaurants I've been to. No need to flag down a waiter; simple eye contact sufficed for any request since the waiters were always looking out for such cues. I'm anxious to try The Modern, Meyer's newest restaurant (just opened this Monday) at the MOMA, and Blue Smoke, his BBQ joint.